Are you eager to try something new on your next vacation? Then, join Play Kiteschool for a fun kitesurfing experience in the stunning beach of Preá! The lessons are tailored to all ages and fitness levels. 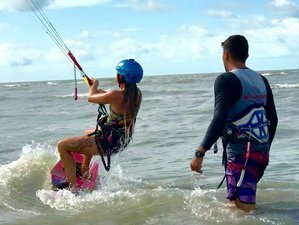 The instructors are experienced, qualified, and certified by the Brazilian Kitesurf Association. In addition, they are super friendly and speak several languages. Play Kiteschool has the latest equipment, storage area, bar, and relaxing area. They also provide repair services. You will stay at Pousada Sitio Phoenix during this camp. The structure offers pergola beside the pool where you can relax or perhaps catch up on your reading, massage facilities, playground for children to enjoy, direct beach access, lounge with tennis and pool tables, restaurant, wireless internet, and private parking. The suite includes a double bed and single bed (or three single beds), air conditioning, minibar, bathroom with hot shower, safe deposit box, and garden view. The bungalow has a bedroom with double bed (or two single beds), air conditioning, safe deposit box, bathroom with hot shower, and living room with a fan, a single bed, and minibar. Moreover, it has a magnificent sea view. The chalet has a bedroom with double bed (or two single beds), air conditioning and safe deposit box, bathroom with hot shower, living room with a fan, a double bed, and a single bed (or three single beds), minibar, and microwave. It also has a lovely balcony with a hammock and a great garden view. The instructors are qualified by ABK (Brazilian Kitesurf Association) and teach classes in several languages. In the structure of the school, the clients can enjoy some hours of leisure with their family. Play Kiteschool has a small bar, restrooms, fresh water showers, and rest area. The clients can also take advantage of Pousada Sítio Phoenix pool, available to Play Kiteschool guests. Ronaldo is the owner and head instructor of Play Kiteschool. He has been practicing kitesurfing since 2004. The school is located at Preá Beach in Cruz, Brazil, nearby the Pousada Sitio Phoenix, only 12 kilometers from the internationally known Jericoacoara Beach. Pousada Sitio Phoenix is located at the entrance of Jericoacoara National Park, only 20 meters from the beach of Preá. The school is situated right next to the pousada. Please book your flight to arrive at Aeroporto Internacional de Fortaleza - Pinto Martins (FOR) (international) or Aeroporto de Jericoacoara - Comandante Ariston Pessoa (regional). The airport transfer costs from the Fortaleza airport to the hotel and back to the Fortaleza airport are 1200 BRL, while from the Jeri airport the costs are 120 BRL. The values are per car with a capacity for up to 4 passengers - it is the same amount for one passenger, two, three, or four passengers. The cheapest solution is the bus. You can check the website of Fretcar, the only decent company that currently makes the trip Fortaleza / Preá. The whole trip takes about seven hours (and it is not comfortable) with a bus change along the way. There are daily schedules leaving the bus station Engenheiro João Thomé and Pinto Martins - Fortaleza International Airport (FOR). Remember that schedules change constantly, so buy your ticket in advance. Fretcar recently began offering online sales option. If you plan to arrive from another city, perform a query and enter the place of departure. Play Kiteschool is a kiteboarding school that is pleased to teach new kitesurfers, with lessons tailored to all ages and fitness levels.